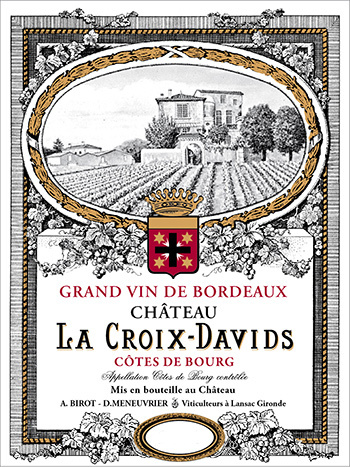 Château la Croix Davids takes full advantage of an excellent position, as its vines are on a very sunny hillside. 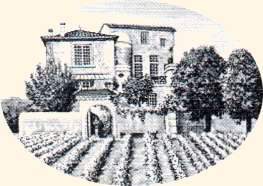 At the end of the french revolution, it was confiscated and sold to a Bordeaux notable and in 1800 it was acquired by the family which owns it to the present day. Dider and Annie Meneuvrier have therefore absorbed the accumulated knowledge of generations, from the long line of vignerons that preceded them. Nowadays, the Meneuvriers cultivate their vineyards with a tradition of quality, making no sacrifices to technological myth. The vineyards are weeded only by ploughing, without use of chemical herbicides. The vinification of this estate's wines are traditional here, with long maceration, (about three weeks) which gives all the fruit and tannin possible. This is a truly great wine, typical of the Côtes de Bourg. It shows their quality in full, and indeed is one reason why the region has a high reputation. The property is on the ancient terroir of Lansac, the classic seat of Bourg wines. The estate has offered a "cuvée Prestige", which has spent 18 months in barrel. This wine has received special care and attention allowing it to combine an elegant nose (fruit and wood) with a well built structure. It achieves harmonious balance, opening out to a long, high quality finish. is produced solely from the oldest vines (more than 50 years old) with rigorous selection. The whole production is aged 18 months in oak barrels, and is subject to the most minute care throughout its vinification. All the best points of Le Croix Davids "Tradition" are there, improved by a touch of wood, with its spicy vanilla notes. 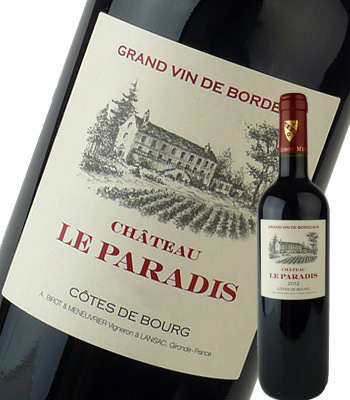 A very fine Bordeaux wine, sadly only available to a few lucky clients, due to the limited stocks available. Produced from the property's younger vines. La Mission des Douais is all freshness and discovery. Without claiming the heights of La Croix Davids, it is nevertheless grown on the same site, and it certainly shows off its qualities well. Less structured, more supple, its character isn't that of a solemn occasion, but the spontaneity of an impromptu party. The Chateau La Croix Davids is built on one of the highest plateaux of Lansac, not far from the town of Bourg sur Gironde. 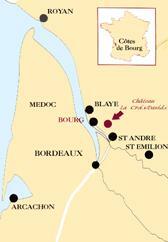 Its vineyards, right at the heart of the "Cotes de Bourg" cover 40 Hectares (100 acres). Vines were planted in the region as soon as the Roman Conquest was completed; that is to say, about the middle of the 1st century BC. 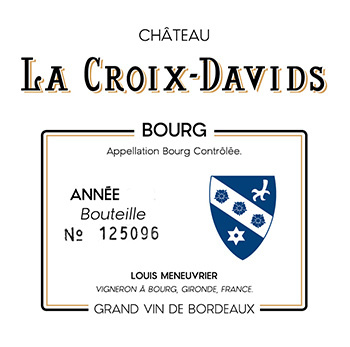 According to some authors, part of the Château La Croix Davids vineyards dates from those days. The clayey lime soil, and the close proximity of the Gironde estuary were always favourable to wine growing, with the angle of the slopes ensuring perfect drainage. This special microclimate, tempering the end of the winter and springtime, and followed by hot and sunny summers, encourages perfect ripeness long before the first autumn mists. 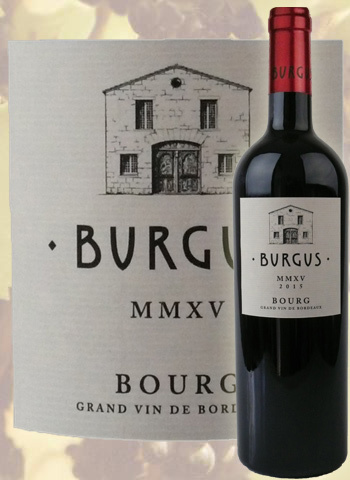 These natural advantages have been responsible for the fact that the Bourgeais, and Lansac in particular, were one of the oldest winegrowing regions in Bordeaux. And it's in this environment that the wines of this marvellous terroir show their best potential and richness. Notes de dégustation : Sous une teinte bordeaux intense se révèle un bouquet harmonieux de baies noires mûres ou cuites accompagnées de discrètes notes de chêne. Bien que la structure soit celle d'un vin de garde, la chair est déjà plaisante, puissante mais élégante. Encore un à deux ans de patience et ce côtes-de-Bourg aura atteint un niveau excellent qu'il conservera dix ans durant. Notes de dégustation : Ce vin est drapé d'une belle robe rubis foncée, il dévoile des arômes très fruités avec d'intenses notes de baies mûres et un boisé aux nuances élégantes et subtiles. La bouche charnue, persistante et très chaleureuse est soutenue par des tanins veloutés et fondus. Notes de dégustation : Vin très tannique, concentré en fruits rouges (mures et cassis), velouté, la finale torréfiée et vanillée. Notes de dégustation : Il peut être dégusté dans l’année, mais pourra aussi bien attendre 2 à 10 ans. Il est conseillé de le décanter environ 1 heure avant le repas. Il dévoilera alors tout son potentiel aromatique complexe et ses saveurs de pruneaux, d’épices et de fruits rouges confits. Un vin Exceptionnel !